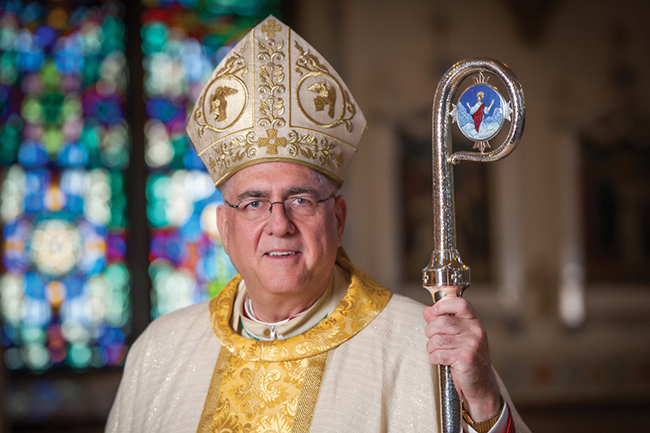 Editor’s note: I was privileged to hear the opening prayer Archbishop Joseph Naumann of Kansas City, Kansas gave at the March for Life. But until I ran across it today on the webpage of the Archdiocese of Kansas’s newspaper, the Leaven, I had not read his homily for the Vigil Mass of the March for Life at the Basilica of the Immaculate Conception, Washington, D.C. delivered the night before the March which is excerpted below. He is also the chairman of the U.S. bishops’ Committee on Pro-Life Activities. Tonight, we gather to commemorate the 46th anniversary of the tragic twin Supreme Court decisions (Roe v. Wade and Doe v. Bolton) that legalized abortion essentially for any reason through all nine months of pregnancy. As a result, since 1973, there have been 61 million innocent American children killed in the wombs of their mothers. The Roe v. Wade and Doe v. Bolton cases were based on deception. The late Norma McCorvey, Jane Roe of Roe v. Wade, lied about being gang-raped. After her pro-life conversion, Norma acknowledged that she was deceived by her attorneys about the reality of abortion. For the last 20 years of her life Norma McCorvey labored tirelessly to overturn the Roe v. Wade decision. Sandra Cano, the Jane Doe of the Doe v. Bolton decision, never wanted an abortion. Her lawyers, whom she had engaged to assist with regaining the custody of her children, used her difficult circumstances to advance their own ideological goal to legalize abortion. She actually fled the state of Georgia, when she feared that her lawyers and family members intended to pressure her to have an abortion. The late Dr. Bernard Nathanson, one of the Founders of NARAL, originally the National Association for the Repeal of Abortion Laws and now the National Abortion and Reproductive Rights Action League, admitted to inventing statistics about the number of illegal abortions. The claim of the Supreme Court that the United States Constitution contained a right to abortion is absurd. We assemble in 2019 with some new hope that the recent changes in the membership of the Supreme Court may result in a re-examination and an admission by the court of its tragic error 46 years ago. We pray that state legislatures and the people of this country will again have the ability to protect the lives of unborn children. At the same time, we are sobered by the ferocity and the extremism of the proponents of legalized abortion as evidenced in the recent confirmation process to fill a vacancy on the U. S. Supreme Court. Recently, two members of the Senate Judiciary Committee questioned the suitability of a judicial nominee because of his membership in an extremist organization, the Knights of Columbus. One of the great goods that Our Lord has drawn forth from the terrible tragedy of legalized abortion has been to unite in common cause Christians of different denominations and members of other faith traditions who share a common concern for the defense of the sacredness of all human life. I am particularly grateful for the presence tonight of leaders of the Orthodox Church who honor us by joining us in prayer. The Orthodox Church has been a strong and consistent advocate for the sanctity of life. I personally treasure the friendships that have been forged with Evangelicals, Baptists, Lutherans, Presbyterians, Anglicans, and many non-denominational Christians through my involvement with the pro-life movement. I believe that Jesus takes delight in seeing his priestly prayer of the Gospel, in part, being fulfilled: “I pray not only for them, but also for those who will believe in me through their word, so that they may all be one, as you, Father, are in me and I in you, that they also may be in us, that the world may believe that you sent me” [John 17:20]. We are grateful for all the non-Catholics with us tonight who have come to join us in prayer, and we look forward tomorrow to marching with many, many other brothers and sisters in Christ and all those who honor God’s sovereignty over human life. Sometimes, our opponents criticize pro-lifers for only caring about the unborn. While in such a broad-based movement there are obviously some exceptions, in my experience of the pro-life community this is simply not true. Millions of pro-life individuals volunteer and financially support the thousands of Birthrights, Pro-life Pregnancy Care centers and Pregnancy Resource centers that provide medical, financial and moral support to parents who often in the midst of difficult circumstances choose life for their child. These centers of love are committed to accompanying parents long after the birth of their child. They are committed not only to the survival of the baby, but to empower mothers and families to thrive for a lifetime. The pro-life ethic challenges us to care about the sacredness of every human being throughout the life spectrum. We are called always and everywhere to promote the dignity of the human person. The theme for this year’s March for Life, Unique from Day One — Pro-Life is Pro-Science, seeks to dispel the notion that advocacy for the protection of the life within the womb is somehow at odds with modern scientific knowledge. Abortion advocates often seek to portray opposition to abortion as an imposition of religious belief. While our Christian faith definitely speaks to the sanctity of life as the biblical readings for tonight’s Mass illustrate, one does not need religious revelation to know the killing of innocent human life is inhumane. The advances of scientific knowledge and technology over the past 100 years have confirmed that a unique human life begins at fertilization. The unborn child, beginning as a one celled zygote and throughout its embryonic and fetal stages of development, possesses DNA, a genetic code, distinct from his or her parents. Ultra-sound technology has given us a window into the womb, allowing us to witness the miraculous unfolding of the development of a new and unique human life. Most significantly, the first chapter of the Bible asserts that human beings are the masterpiece of all creation. Men and women are uniquely made in the Divine Image. Psalm 139 reminds us how God knit us together in our mother’s womb and that we are fearfully, wonderfully made. Human beings alone amongst all of creation are given the ability to reflect, to understand, to ponder, and, most importantly, the freedom to choose the good and the noble, the freedom to choose to do God’s will or not. The choice by our first parents to deny God’s lordship, to refuse to do his will — to seek to be their own god, had disastrous results. It brought back the original chaos — a moral chaos. You want a glimpse of this moral chaos, just read a newspaper, watch the evening news, or observe the nihilism present in much of our art, music, literature, and films. If you want to view a powerful illustration of the tragic consequences of this moral chaos, watch the movie Gosnell: The Trial of America’s Biggest Serial Killer…. The Gospel is all about mercy. Our Lord’s mission is all about mercy. And we, His disciples, must also be about mercy. Our pro-life ministry is about mercy: 1) mercy for the innocent and defenseless child in the womb, 2) mercy for frightened and overwhelmed mothers in the midst of a difficult pregnancy, 3) mercy for post-abortive mothers or fathers who deeply regret authorizing the killing of their own child; 4) mercy for the abortion advocates who verbally attack us and label us extremists; 5) mercy for those who wish to disqualify from public office members of the Knight of Columbus or anyone else in whom “the dogma lives loudly”; 6) mercy for abortion clinic workers, volunteers and, yes, even abortionists. Nearly every diocese in the country has an abortion healing ministry, most often called Project Rachel, to bring hope and healing to all those wounded by abortion: the mothers, the fathers, and anyone involved in advocating, assisting or performing abortion. God’s mercy is endless. For all are made in the Divine Image and are of such inestimable worth that God died for them. Let us come forward in a few moments filled with faith and awe to receive the Bread of Life who is the Lord of Life. Let us give thanks for the great dignity God has given to us, to be made in his image and even more to be his living temples, his living tabernacles in the world. Let us receive with great joy, devotion and confidence this God who has pursued us and died for us. Let us ask the Lord of Life to help us be His witnesses of merciful love in the world! Praise be Jesus Christ, the Lord of Life forever and ever!